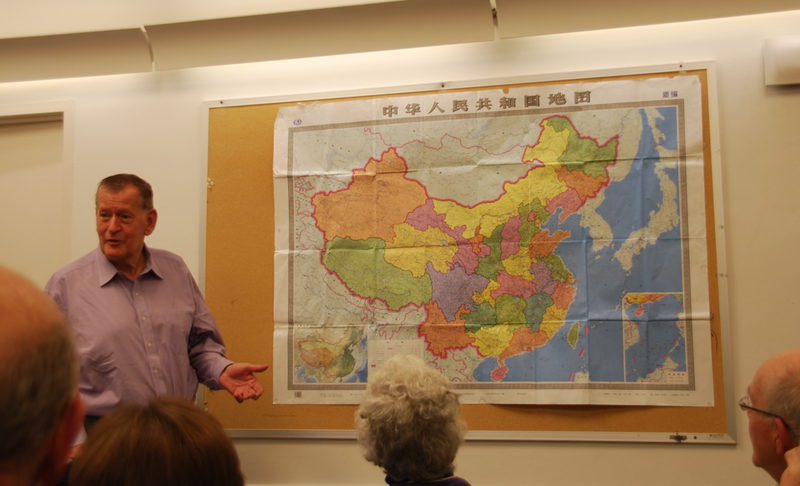 The distinguished China expert, Ross Terrill, began his talk at the South End library on April 26 by hanging a large map on the wall that left no doubt about China's size. "China has fourteen contiguous borders with other countries," Terrill said. "Most of them are not friendly, and neither is Japan, located just across the water. This is quite different from the United States, which is surrounded by two oceans and two relatively friendly neighbors. It affects many things," Terrill said. "The Europeans and the Americans believe in the idea of the international community," he cited as an example. "China does not. They are nationalists." Some of China's neighbors are largely Muslim, Terrill pointed out which always brings up the question of loyalty for the People's Republic. He added. "The tension that exists now in China revolves around the question of whether China can have economic freedom without political freedom. The grip it has over the economy is inseparable from its one-party system." He said he doubts there will be an evolutionary path to political change and expects, rather, more of a "big bang." China expert and South End resident, Ross Terrill, hung up a map of China to explain why it feels surrounded by countries that are not its friends. Australian-born Terrill, currently a Research Associate at Harvard's Fairbank Center for Chinese Studies and the author of nine critically acclaimed books, had traveled to India as a graduate student at the suggestion of his Melbourne professors who thought that, as a democracy, India would be of more interest than its authoritarian neighbor, China. But Terrill did not take to what he called the moralism of its Prime Minister Jawaharlal Nehru, or India's grinding poverty, and decided China could not be worse. To get a visa, Terrill in vain badgered Chinese embassies all over Eastern Europe until, after one day accusing the Chinese embassy in Warsaw of "not wanting to let anyone know anything about China," he learned the next day that a visa to China was ready and waiting for him. It was 1964. There was not a single US diplomat in Beijing. At the time, there were 980,000 American troops stationed in a semi-circle around China and the political gap with the U.S. was deep. For the U.S., Taiwan was the legitimate government of China. Ross Terrill speaking at length about his distinguished career. Terrill sent a report he wrote about his first experience in China to his fellow Australian Rupert Murdoch, who still edited his own newspapers at the time; Murdoch published the work in six installments. Shortly thereafter, Terrill assisted another up-and-coming Australian, Labor Party leader, Gough Whitlam, to visit China and meet with Zhou Enlai, the first Premier of the People's Republic. As it turned out, Henry Kissinger was in China at the same time to lay the groundwork for the visit by Richard Nixon. The China trip catapulted Whitlam into political prominence as Australia's Prime Minister in 1972. Terrill, in the meantime, earned his PhD in political science at Harvard in 1970 and his thesis, which was published as Socialism As Fellowship, won the prestigious Sumner Prize. 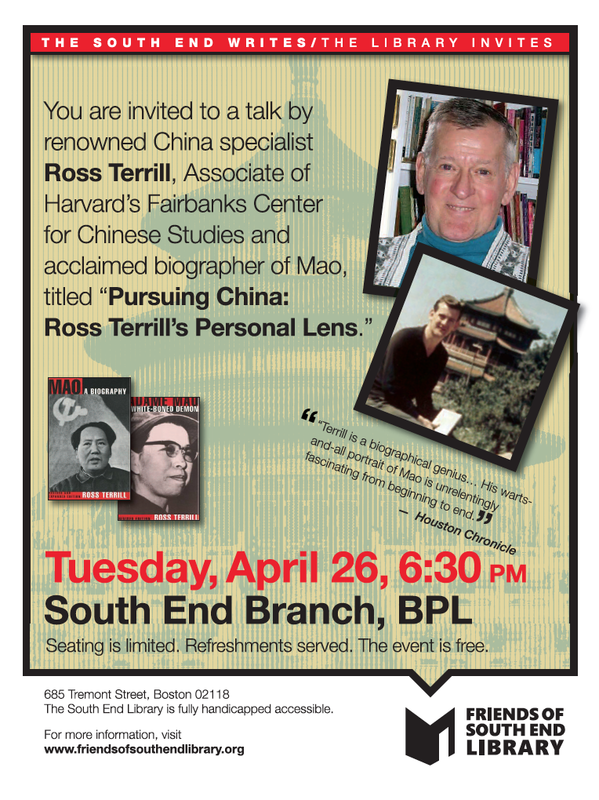 "People were hungry for information about China," Terrill told the audience at the South End library. 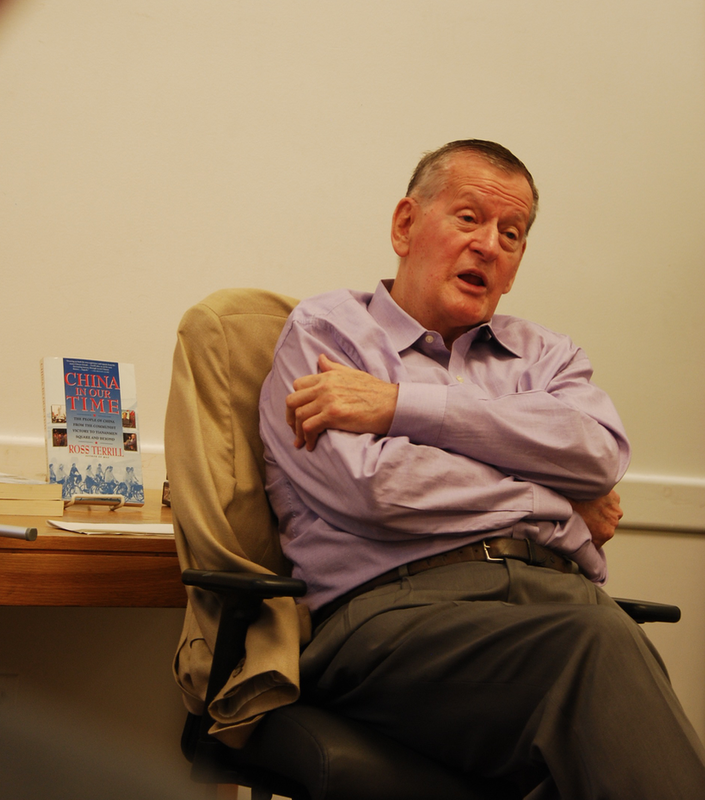 For the rest of his career, he visited China annually, became an award-winning contributing editor to The Atlantic Monthly, the New York Times, Newsday, the Chicago Tribune, the Miami Herald and the Washington Post, as well as a special commentator about China to many other media outlets. Older PostThe South End Library's Local/Focus Window by SE firm Smiling Button Features Dresses Inspired by Children's Books Like "Eloise," "Make Way For Ducklings" and "Alice in Wonderland"